This is a widespread, tough shrub with honey-scented flowers whose garden potential is often overlooked. 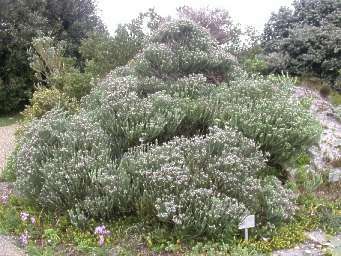 Metalasia muricata bush is a greyish, rounded, sturdy shrub, 2-4 m tall, that is found in coastal to mountainous regions of southern Africa. Although not formally divided into subspecies, there are a number of different forms occurring in different areas of its wide geographical distribution. 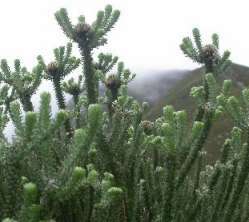 The leaves are alternate, needle-like, 6-18 mm long, scattered, sharp-tipped, green-grey and smooth or woolly. 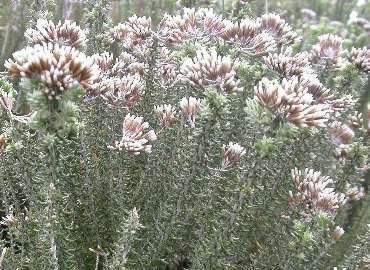 The honey-scented flowers vary in colour from common white to pink or purple. Full bloom is in winter in terminal clusters up to 60 mm diam. The fruit is a ribbed nutlet with a bristly pappus. The white or greyish main stem bark is sometimes not visible as it is obscured by the many dense branches. Least Concern (LC), Metalasia muricata is widepread, abundant and not declining. Metalasia is widespread in the Western Cape, from the coast to the mountains. It also occurs in other parts of South Africa, KwaZulu-Natal, Free State, Eastern Cape and Lesotho. Its wide distribution includes forms tolerant to frost, and poor, sandy soils. The name Metalasia is derived from the Greek Meta which here is interpreted as backwards/reverse and lasios, woolly, referring to the woolly undersides of the leaves; muricata is derived from murex, and means roughened and with hard points like the shell of a mollusc. Metalasia has about 33 species in South Africa and many of them occur in the Western Cape. These include: M. punges, M. serrata, M. brevifolia, M. cephalotes, M. densa, M. montana and M. plicata. Metalasia can be grown from seed; however, seed from the Western Cape responds better to smoke treatment. In a garden setting, it can be used as a filler to provide flowering and greyish interest throughout the year. It's a low maintenance and water-wise shrub that can do with an occasional pruning. Burman, L. & Bean, A. 1985. Hottentos Holland to Hermanus . Botanical Society of South Africa, Cape Town. Cowling, R. & Albertyn, J. 1997. Southern Overberg . South African Wild Flower Guide 8. Botanical Society of South Africa, Cape Town. Goldblatt, P. & Manning, J.C. 200o. Cape plants. A conspectus of the Cape flora of South Africa. Strelitzia 9. National Botanical Institute, Cape Town and Missouri Botanical Garden. Pooley, E. 1993. The complete field guide to trees of Zululand and Transkei. The Natal Flora Publications Trust, Durban.